The change in season seems like the perfect excuse to clean out your wardrobe. In Denmark spring has been exceptionally cold this year, and I’ve only recently begun to discover other parts of my wardrobe than my winter basic knits and long sleeved tees. Last weekend I spent a couple of hours cleaning out my wardrobe, making it feel updated and ready for spring and summer, which is hopefully just around the corner. Fingers crossed! Before getting started I had a look at my pinterest boards (you can find mine here) to get an idea of what inspires me at the moment, what is my overall style and which garments/color/cut would I want to keep in my wardrobe for the upcoming season and which do I want to store away until autumn. 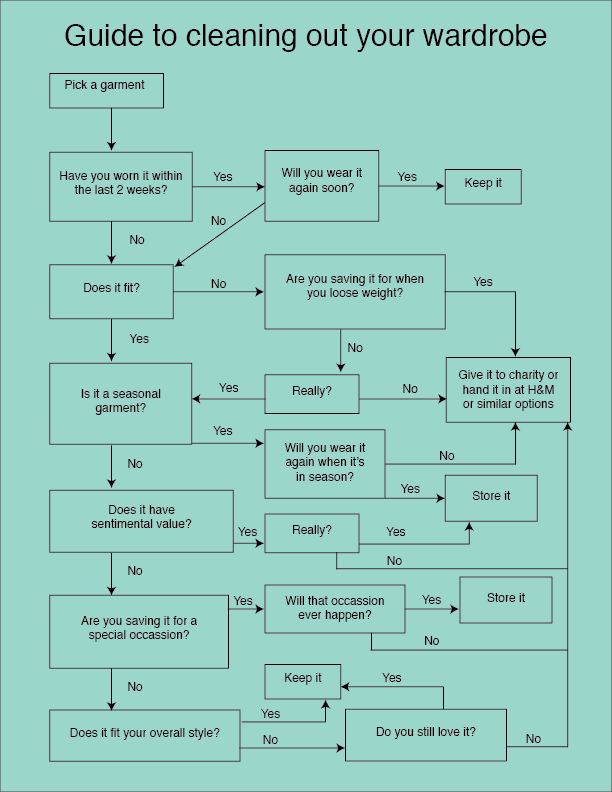 I’ve developed this illustration as an easy-to-use-guide if you want to clean out your own wardrobe and make it organized for the new season. In my opinion you should never save items for when you loose weight, as they will be a constant reminder that you’re not happy with your body as it is and nobody needs that. If you’re determined to keep it, store it away, but don’t have it in plain sight to remind you on a daily basis. Always remember to NEVER throw any of your garments in the bin – instead you should donate the garments that can still be worn to charity and give yourself a pad on the shoulder. Or you can hand everything in at any H&M store and receive a discount voucher in exchange – even the garments that are ripped or too worn out can be recycled in many different ways and thus still have value outside of the trash bin. With the discount voucher at H&M you can update your wardrobe with necessities for the new season – please check out H&M’s organic collections first or go for classic, quality basics. Remember to choose consciously – like I talked about in this post. Check back in on Tuesday to see my five basics for summer. I hope you’ll have fun cleaning out your wardrobe! Enjoy the weekend!